Introduction: The year 2001 has proven to be a very successful trout and bass fishing season for me. Fishing most of the lakes, rivers, and streams in the San Francisco bay area to as far as the Eastern Sierras I had to make a judgement between what kind of flotation device I would want to use for most of my fishing adventures. Being at TT I had many choices to choose from. My desire to seek out large fish, especially aggressive leaping trout made me come to the conclusion of choosing something that is versatile, easy to transport, high performance, and safe. Tests: A float tube was my choice. I obtained a Stillwater Talon for my vigorous tests that I will be putting it through for quite some time throughout my fishing trips. The Talon is a triangular shaped, also known as �V� shaped float tube. This unique triangular shape has many benefits over the more traditional donut and U-shaped tubes. The triangular shaped design allows a person to easily cut through the water and wind with minimal effort resulting in more fishing time, the ability to be more agile, and much more. Once I was fishing in a lake that was calm in the morning, but by the afternoon when I was exhausted and ready to get back to my launch area the wind was blowing against me. The Talon�s shape allowed me to kick my way back to my car in a short amount of time while using little energy. Another benefit from the �V� shape is the stability the float tube provides. I have done intensive tests on this float tube trying to overturn it by leaning hard right, left, front, and back while sitting down. The entire tube never lifted off the water. Of course if you throw your entire body over the sides or front of the float tube you will definitely be in the water (I am sure that�s true for all float tubes out there today). Since the float tube is triangular shaped the front is open. The open front is a plus because of the ease of entry; also getting out is simple. There is no hassle of getting the tube around you legs first before putting on your fins, you are able to look down while walking into the water, and you can easily sit down and snap on the stabilizer bar once you are afloat. The Stillwater Talon uses a stabilizer bar to keep the unit as one. Some say that the open front float tubes are not stable, but not this one. I felt safe while float tubing in lakes of any size. The bar in the front kept my float tube solid. On the topic of safety the Talon has many features that kept me from worrying about sinking to the bottom and allowed me to concentrate on fishing. 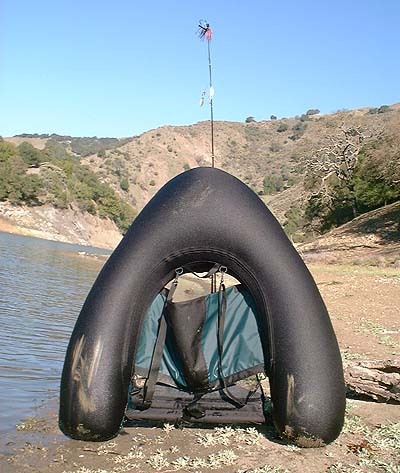 The float tube�s outer body is constructed with 420 denier nylon pack cloth on top and heavy duty 600 denier poly duck fabric on the bottom of the tube. Fishing in the summer time can be tough because of the large amount of concentrated weeds and low water level which exposes many structures that can puncture your float tube such as trees and sharp rocks. The tough bottom on this float tube kept me safe and worry free when I ran into branches that came up from the bottom of the lake. Having at least two bladders in a float tube is a must for me. 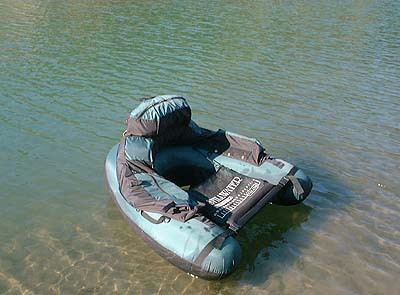 The float tube I tested had three � one main and two backrest bladders. Having three bladders mean that if the main one is punctured, then I will have two more bladders to get me safely on shore. Other features that came in handy are the 13 D-rings to attach accessories on like my trout net and floating live tank, detachable shoulder straps to carry the float tube while hiking miles into the backcountry waters, three rod holders for those who carry many rods when bass fishing, and two large side storage compartments that fits all the necessary gear I need for bass or trout fishing. One gripe I have about the Stillwater Talon is that there is almost no additional space to attach any accessories via straps such as a depth finder because of the location of the front rod holder. The only choice to adding strapped on items is to sacrifice that space. Conclusion: The Talon is a float tube with many high quality features without paying the big bucks. My tube served its purpose and with the abuse I put the float tube through, the device is still in good working order without any damages. Even if there are any manufacturer's defects, Stillwater has a lifetime warranty on their products. Aside from the one complaint I have, I would have to give this particular float tube a thumbs up! Have fun and keep on fishin!